This article by Steve Horn is re-posted from DeSmogBlog. President Barack Obama will be publicly sworn in today—on Martin Luther King Jr. Day—to serve his second term as the 44th President of the U.S.
Today is also the three-year anniversary of Citizens United v. FEC, a U.S. Supreme Court ruling that—in a 5-4 decision—deemed that corporations are “people” under the law. Former U.S. Sen. Russ Feingold (D-WI)—who now runs Progressives United (a rhetorical spin-off of Citizens United)—said in Feb. 2012 that the decision “opened floodgates of corruption” in the U.S. political system. But not this time. With a fundraising goal of $50 million in its sights, the Obama Administration has “opened floodgates” itself for corporate influence-peddling at the 57th Inaugural Ceremony. A case in point: the Obama Administration’s corporate backers for the Inaurguation have spent more than $283 million on lobbying since 2009, the Center for Public Integrity explained in a recent report. One of the biggest givers so far is none other than what Pulitzer Prize winning investigative journalist Steve Coll calls a “Private Empire“—ExxonMobil. 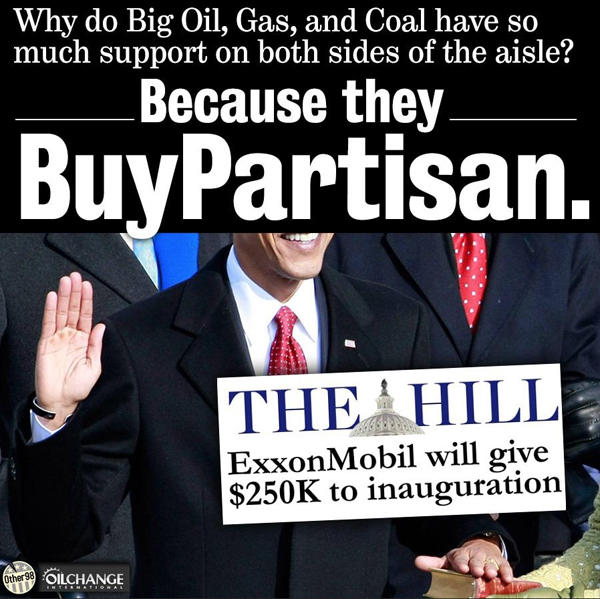 According to a scoop by The Hill, ExxonMobil contributed $250,000 to the Inaugural Committee. Additionally, ExxonMobil attorney Judith Batty has given the Committee $10,750, according to the Center for Responsive Politics. Thus, ExxonMobil has given the Committee a grand total of more than $260,000. ExxonMobil earned a profit of $41.1 billion in 2011 and in the first three quarters of 2012 earned a profit of $34.92 billion, well on pace to surpass its 2011 profit margin. Some mathematical context is warranted. This means ExxonMobil earned $9,935 per minute in the first three quarters of 2012, $596,107 per hour and $14.3 million per day in profits. Citizens for Tax Justice reported Exxon paid only 17.6 percent taxes in 2010, lower than the average American, and a Reuters analysis using the same criteria estimates that Exxon will pay only 13 percent in effective taxes for 2011. Exxon paid zero taxes to the federal government in 2009. In practice, this means that ExxonMobil actually pays less in taxes by percentage than an average Middle Class American family. For a corporation with financial wealth of this magnitude and one that, to boot, evades paying taxes, $260,000 is truly a “drop in the bucket.” And yet in a political system favoring those who can “pay to play,” it’s a true game-changer in terms of gaining direct access to the Administration. Critics say it’s more of the same out of an Obama Administration that in the first term had a cozy relationship with corporate patrons. “It fits into a pattern of not treating this campaign-finance issue with concern when in fact it is of great concern to the integrity of the political process and our democratic system,” Fred Wertheimer, president of Democracy 21, told The Hill. The Obama team’s response? According to them, they are champions of campaign-finance reform and anti-corruption measures. “This president has done more to reduce the influence of special interests in Washington than any administration in history,” White House spokesman Eric Schultz told The Hill. ExxonMobil, are only part of the criminal scene, the CEOs must have a lot of fun in the board rooms playing their games and being beyond the law and beyond morality, it is amusing the human condition of today. I am invited to The Anti Corruption Australia forum, Richard Alderman ex former fraud office UK, and such like, the cost to attend this conference is between $1995.00 $3294.00, myself I support Julian Assange, if for nothing else than the machine gunning down of innocent people from a military helicopter, the question to all you out their, is a condom that Assange, reputable never put on, being charged for a criminal process, as significant as the murderers who killed these innocent people, apparently no further word from this incident I have not heard, do you think attending the A-C forum, that Mr Errol Raiser, may enlighten us as to these sorts of questions? The problem with these investigations as this forum attempts to explore corruption is they are all part of it, what they would tell you off record is another story that has no relevance to what this conference is on, it is no less than a exercise to placate the weary, the weary are weary having heard the bureaucracy all before.